Some sixty years after the Spanish conquest of Mexico, a group of Nahua intellectuals in Mexico City set about compiling an extensive book of miscellanea, which was recorded in pictorial form with alphabetic texts in Nahuatl clarifying some imagery or adding new information altogether. This manuscript, known as the Codex Mexicanus, includes records pertaining to the Aztec and Christian calendars, European medical astrology, a genealogy of the Tenochca royal house, and an annals history of pre-conquest Tenochtitlan and early colonial Mexico City, among other topics. Though filled with intriguing information, the Mexicanus has long defied a comprehensive scholarly analysis, surely due to its disparate contents. 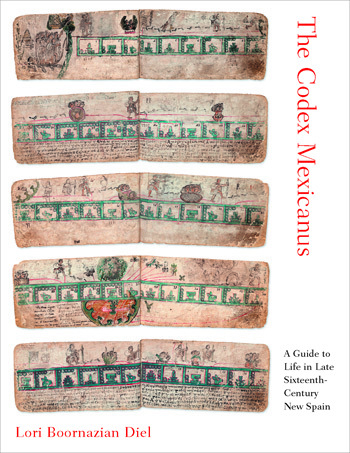 In this pathfinding volume, Lori Boornazian Diel presents the first thorough study of the entire Codex Mexicanus that considers its varied contents in a holistic manner. She provides an authoritative reading of the Mexicanus’s contents and explains what its creation and use reveal about native reactions to and negotiations of colonial rule in Mexico City. Diel makes sense of the codex by revealing how its miscellaneous contents find counterparts in Spanish books called Reportorios de los tiempos. Based on the medieval almanac tradition, Reportorios contain vast assortments of information related to the issue of time, as does the Mexicanus. Diel masterfully demonstrates that, just as Reportorios were used as guides to living in early modern Spain, likewise the Codex Mexicanus provided its Nahua audience a guide to living in colonial New Spain. Diel is a professor of art history at Texas Christian University. She is the author of The Tira de Tepechpan: Negotiating Place under Aztec and Spanish Rule.